Location – it’s all about convenience and quality of living. 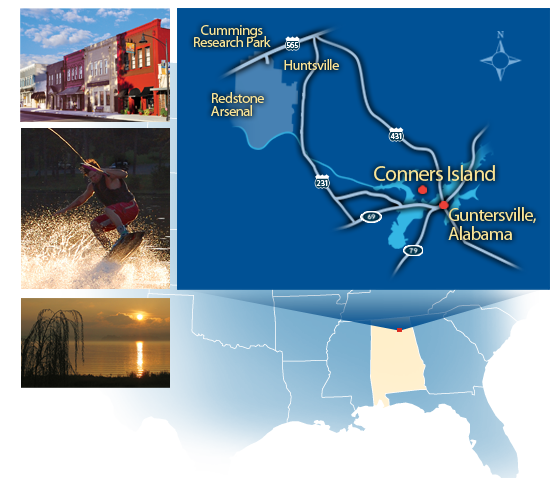 Conners Island is located on Lake Guntersville, in North Alabama’s scenic Mountain-Lakes region on the Tennessee River. Just 25 miles south of Huntsville, the park is centrally located 75 miles north of Birmingham, 135 miles south of Nashville, and 150 miles northwest of Atlanta. It is in the city limits of Guntersville. Literally surrounded by 68,000 acre Lake Guntersville, this is one city that makes quality of life a way of life. And that quality is reflected at every turn by the stunning beauty of nature’s handiwork – a combination of water, mountains, and trees that frames friendly neighborhoods, progressive business districts, excellent schools, and unmatched recreational opportunities.